Shiny Dunsparce Hunter in game: 38 Who? Important notice! Pokemon Shiny Dunsparce Hunter is a fictional character of humans. Dunsparce (Japanese: ノコッチ Nokocchi) is a Normal-type Pokémon introduced in Generation II. Dunsparce is a serpentine Pokémon with a primarily yellow body, blue underside, and blue-and-cream-striped back. Its head is round with a wide mouth extending under its jowls and curving up toward the middle of its face. Its chin is blue with two rounded prongs. Its eyes—round and rimmed with blue—are kept closed, revealing its cream-colored eyelids. On Dunsparce's upper back are two small, white, bird-like wings split into two sections each. Its body ends in a striped, drill-like tail. 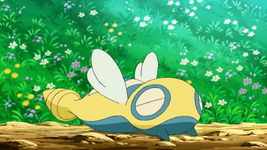 Though Dunsparce can float slightly with its wings, it avoids detection by burrowing into the ground with its tail. It lives immobile in caves and beneath the earth, where it makes maze-like nests. Dunsparce made its anime debut in The Dunsparce Deception, where an entire town was full of children with Dunsparce. A Dunsparce appeared in The Path That Leads to Goodbye!. Ash tried to catch it, but Iris's Axew bumped into Ash's Pikachu, which led to the Dunsparce escaping. A Dunsparce appeared in Under the Pledging Tree!. Ash wanted to catch it, but then realized he didn't bring any Poké Balls with him, thus letting the Land Snake Pokémon get away. A Dunsparce was seen in the wild in The Legend of Thunder!. A Dunsparce made a cameo appearance in Following a Maiden's Voyage! in Ariados's web. A Coordinator's Dunsparce appeared in Team Shocker! participating in the Performance Stage of the SolaceonContest. A Dunsparce appeared in Alexa's magazine in The Journalist from Another Region!. EP191 Dunsparce Ash's Pokédex Dunsparce, the Land Snake Pokémon. 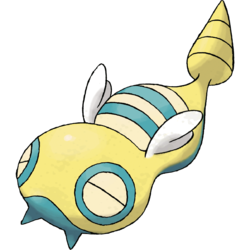 When discovered, the Dunsparce uses its tail to burrow into the earth and evade capture. BW131 Dunsparce Ash's Pokédex Dunsparce, the Land Snake Pokémon. Dunsparce uses its tail to dig its elaborate nest. Crystal and her Chikorita captured a wild Dunsparce in A Flaaffy Kerfuffle where it along with a Flaaffy had been stranded on Bill's boat. Much later, in Volume 23, Lostelle, who has a Dunsparce, faxed Bill and informs him of Deoxys's rampage and Giovanni's subsequent appearance on Three Island. In The Final Battle V, during the Trick Master's story of the homeland soil, a Dunsparce appeared in the flashback when it was one of the Pokémon calmed down by it. Many volumes later, in the Diamond & Pearl chapter, Roseanne is attacked by a pack of Yanmega controlled by Mars. Diamond told her to take refuge in the hole her Dunsparce dug. Pokémon Mystery Dungeon: Gates to Infinity: Dunsparce is a supporting character throughout the game. When spotted, this Pokémon escapes backward by furiously boring into the ground with its tail. If spotted, it escapes by burrowing with its tail. It can float just slightly using its wings. It hides deep inside caves where no light ever reaches it and remains virtually motionless there. 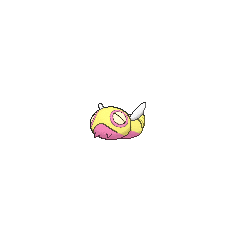 Dunsparce has a drill for its tail. It uses this tail to burrow into the ground backwards. This Pokémon is known to make its nest in complex shapes deep under the ground. Its drill-tipped tail is used to burrow into the ground backwards. This Pokémon is known to make its nest in complex shapes deep under the ground. It digs into the ground with its tail and makes a mazelike nest. It can fly just a little. It composes mazes in dark locations. When spotted, it flees into the ground by digging with its tail. Dunsparce has a drill for its tail. It uses this tail to burrow into the ground backward. 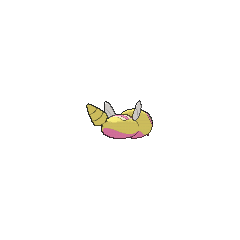 This Pokémon is known to make its nest in complex shapes deep under the ground. Moves marked with a superscript game abbreviation can only be bred onto Dunsparce in that game. 51%-100% HP Please, don't look at me like that. It makes me very self-conscious. 26%-50% HP Oh, please don't say so. Half my HP is already gone? Level up Leveled up! Oh, but please don't look... It isn't very nice. Fills the Mega Gauge of a Pokémon of the same type more. 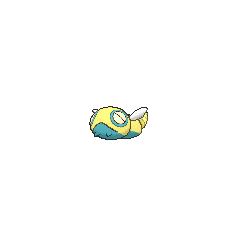 For other sprites and images, please see Dunsparce images on the Bulbagarden Archives. 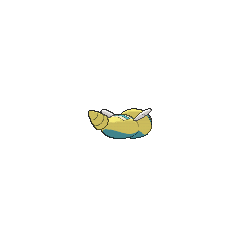 In the anime, Dunsparce is usually shown to be much shorter than 4'11" (1.5 m), which is its listed height (or in this case, length) in the games. It is also shown as much smaller than its listed height in Pokémon Mystery Dungeon: Gates to Infinity and Pokémon Super Mystery Dungeon, being even smaller than Pikachu. Dunsparce was designed by Hironobu Yoshida. 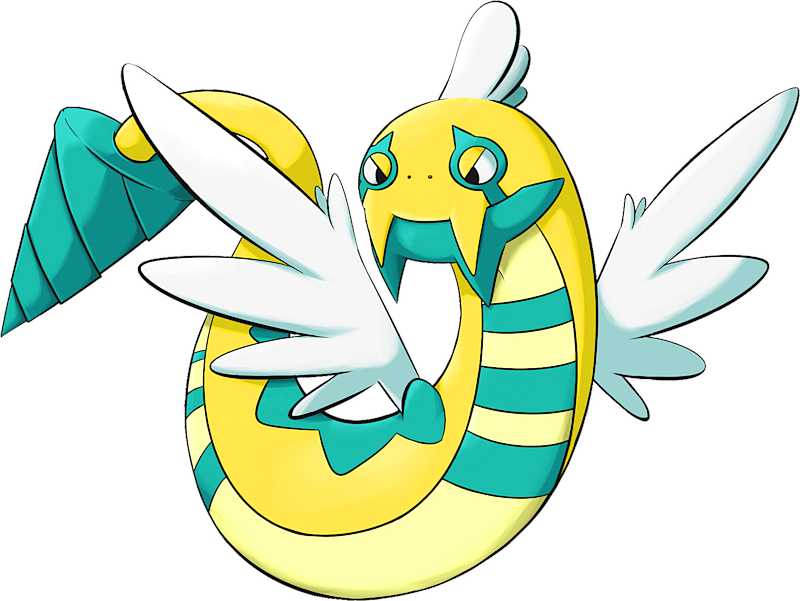 Dunsparce is based on the mythical Tsuchinoko, a serpentine cryptid of Japan. Similar to Bigfoot or the Chupacabra, sightings and reports appear in Japanese media; however, hard evidence is always lacking. Tsuchinoko are 30 cm to 80 cm long, with a large head and poisonous fangs. Its body is thicker than its head and tail. The noises it makes resemble squeaks, chirps and snores. Unlike real snakes, which slither from side to side, a Tsuchinoko wiggles ahead in a straight line. The Tsuchinoko curls its body to leap through the air. Moreover, the fact that Dunsparce, a snake-like creature, has wings also brings to mind the motif of the Feathered Serpent, a prominent fake or supernatural being in many Mesoamerican religions. In addition, Dunsparce shares some traits with bumblebees, including their stripes, tiny wings, stinger-like tail, and the fact that they burrow into the ground. This may be a visual pun inspired by the name "bachi hebi" (literally "bee snake"), which the Tsuchinoko is also known by. Dunsparce may be a combination of dun (grayish yellow or gloomy), dunce, and sparse (referring to its rarity). Nokocchi is an anagram of ツチノコ Tsuchinoko, a fabled snake-like creature.